"Old Faithful" Wooden Snare Drum - AKA "Number One"
This Slingerland Artist Model 5.5 x 14 drum (3-ply, 8 lugs) was used by Neil Peart starting in 1977 on the 2112 tour. He continued using it through the Counterparts tour. 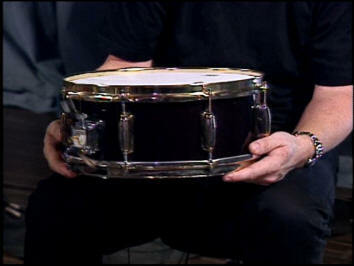 He replaced it as his "number one" snare drum during the Test for Echo tour, when he switched to Drum Workshop drums. Scott K. Fish (SF): Are you still using your Slingerland wood snare with the Artstar drums? It was the first wooden snare I ever owned. I'd always used metal ones before that and had never been totally satisfied. Then we picked up this wooden snare and it was perfect. It was the one. Then I thought, "Well, if this isn't even the top-of-the-line wooden one, I must be able to get something better." So I got the top-of-the-line wooden Slingerland, and I've tried several of the wooden Tama ones. I even have the twin to that $60.00 snare behind me for the other kit. Everything's identical, but it just doesn't sound the same. I think somebody who had this snare before me did a modification on the bearing edge of the snare side. Someone filed the bearing edge where the snares go across. It's murder on snare heads because it makes the tension very uneven, but the snare never chokes. I can play it however delicately or however hard, and it will never choke. SF: Have you ever had Tama try to duplicate that drum? NP: No. Basically I've just tried what Tama makes. They either sound good loud or they sound good soft. None of them have the versatility that my snare has. I haven't pursued it that much because my snare makes me happy as it is. I'm not looking for something better, really. SF: Is the inside of the snare Vibrafibed? NP: No. I've never fooled around with it. I was even afraid to get it painted. For a long time it was copper colored. When I had the black drums or even when I had the rosewood Tamas, it didn't matter so much. It looked okay. When I got the red drums, the copper started to look a bit tacky, but I was even afraid to get it painted because disassembling it, painting it, and putting it back together might have affected it. I think Slingerland probably still makes that snare. I still have one of their top wooden snares too. It's good. I have a Gretsch wooden snare, and it's also a good wooden snare.